I’ve had so much fun writing and drawing the past few strips, I think jefbot’s going to be leaving his apartment more often from now on. Awww. They bring Musashi with them! That’s adorable!! Lets hope Jef doesn’t kill himself! You know, electricity and water and all that jazz? Ah, so Michael now remembers why he doesn’t drag jef out as much. yep, Musashi’s little eyes are sensitive Ion, so he definitely needs the sunglasses! 😉 and call me crazy, but a tiny, hamster-sized Reich Gärt spray can for Mu sounds pretty cute to me. if memory serves, i believe Xinda still has the human-sized version, which is not so cute. Im sure jefbot is going to go out more often. Its not fun only for you, you know. Musashi in a ball is great, still stylish with sunglasses. I hope that Jefbot will end up in water at least once, it would be a shame if he were to just geek it out by the sea without actualy tasting salt. I hope his electrical equipment will survive though. thanks for pointing that out to xinda, Hans, since i was late in responding. and i hear ya about wanting to get to the beach soon. do those goggles you’re wearing have uv protection!? your brother sounds like a cool dude, DJ! mombot’s always asking me what i’d do during an extended power outage. i think i could occupy myself with “books and a pencil and paper.” at least for a little while. I love all the details you put into the strip. the palm trees to the umbrellas and the sand plants. the seashells and power cords as well as the birds too. Gotta love how Musashi is all ready to go with his hammy ball! JB in his regular t-shirt and jeans at the beach? Eesh! Is he at least wearing sandals? 😛 You would figure with an iPhone, and an iPod that would be enough for JB, but I guess there’s a lot more to it then that. Looking forward to Fridays strip, and what hilarity it will hold. Again love the details in this one! panel 1 = glorious. wow, Jeff. i think that’s the first “glorious” i’ve gotten to describe the strip. thanks, dude! ps. all that electricity is going to give jefbot ball cancer. thanks man, i let xinda know. 🙂 and growing up around electronics has provided jefbot with an immunity to the bad ball rays. OMG! I LOVE this weeks! The color is amazing… It makes me want to be there so bad!!! …and I think it’s even better that you could care less… All you want is your tech set up! Outstanding job Jefbot, I’m always happy that each week tops the last! seriously, Funnyshaffer – all these beach strips are making me bummed that i haven’t been at all this summer! my illustrated counterpart gets to go, but i don’t. sad. WOW!! Love this! and that first panel is beautymous!!!!! I’m digging the change of scenery, Jeff. Sorry we didn’t see you at San Diego. Next time, hopefully! yes, next time definitely, Kevin! Ah, tech people, care alot less about nature, more on the computer and games, the joys of it all! LOL, everybody is commenting scenery and I realised that I forgot to mention ship that looks like aircraft carier in background, I know its cargo transport, but still, the resemblance is there. Wow, another gorgeous strip! You’re art just keeps evolving and evolving. Really beautiful! LOVE the artwork here. Also, funny strip. I’m a fan. I hope they remembered their sunscreen…..
Hi again, BOT! I return to posting my awkward comments on your comics. Just don’t call it a come back. Why do I get this feeling that the moment JefBOT removes any clothing all surrounding areas will burst into flames due to the blinding white light that is his un-tanned bod? welcome back, Foxmouse! glad to see you here on the site again, we’ve missed you. 🙂 you might be surprised – since he’s only 50% caucasian, jefbot’s skin isn’t as pale as you’d think it would be from him spending most of the time in his dark lair and away from the burning light of the sun. wow! thanks for the huge compliments Michael! i’ll try not to cut off an ear… heheh. Hey neato palms! And coconut trees? I love this beach. 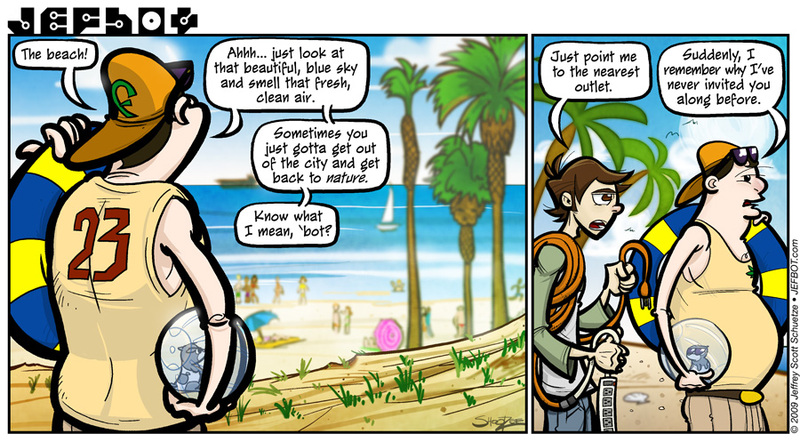 It’s also funny how Jefbot is kinda overdressed for the beach. it’ll definitely be a storyline i’ll explore, Trevory: “jefbot: unplugged.” heheh. not just yet, though. Trevory, I dont doubt he has some emergency backup generator stored somewhere. very true, Maryz. very true. Woo-hoo, my (the public library’s) net connection is back up. I really gotta get my own (or start stealin’ a neighbour’s wi-fi). Beautiful strip dude, lighting kinda reminds me of St. Ives in Cornwall. Love the idea of haulin’ copper to the beach. Nowadays when i’m out ‘n’ about i’ve got a coupla cheap and laptop sized briefcase solar panels. If the basta fire ball wants to give me cancer i’m gonna power some electronic fun from it’s rays. Beautiful strip, Jeff! And, hilarious as usual! Simply run the line to the Tardis. OMG….Musashi in last panel looks so super……lolzz…………wow…only a week gone and i missed on so much……. thanks, JF3! Mu is pretty stylin’ there, i agree. heheh. It’s true. Jefbot’s always plugged-in. Hampster ball at the beach? Classic.